“More riding,” Wyn complained as she looked at the horses that waited in the yard of the inn. They had arrived late last night by TARDIS and The Doctor had demanded and got lodgings for them with very comfortable beds, huge four posters with curtains that closed around them to keep out the draughts of a blustery and wet October night. This morning they had eaten the most peculiar breakfast any of them had ever eaten, boiled bacon served in huge joints that were carved with sharp knives at the table, bread made from barley, and ale in huge pewter tankards that held at least a pint and a half. The Doctor had drunk his down with no apparent ill effects. Jamie had managed half of his. As a Time Agent he had drunk in plenty of space ports where stranger things than ale were served, he pointed out. Stella and Wyn did no more than take sips to mitigate the saltiness of the bacon. “How long until coffee and tea become available in this country?” Stella asked as she wrapped the long, warm riding cloak around her against the cold. They were waiting for The Doctor to arrange the transport of the TARDIS by horse and cart. It had stopped raining and it wasn’t windy now, but there was an iron grey sky and it was cold and they wished he would hurry up. Wyn sighed and thought of latte’s served in warm cafes with hot croissants and jam in little individual pots. Jamie was missing the automatic drinks dispenser in his bedroom, too. But he smiled bravely. “You just didn’t want to wear the clothes,” Wyn teased her lover, who was in male form today. It was better, The Doctor had said, for them to travel the early seventeenth century roads as two men and two women rather than one man and three women. It meant that Jamie was required to wear the early seventeenth century gentleman’s attire of doublet and trunk hose, which he felt less comfortable in than The Doctor seemed to be. The two bone fide women looked elegant in dresses of the period. It was past the time of very excessive ruffs, at least, and they had high collars that were quite practical in keeping the neck warm. “The corset underneath is killing me, though,” Stella pointed out. She was still reeling from the shock of NEEDING something that laced up tight on her in order to get into a period dress. She thought she already had a perfect figure. “All right,” The Doctor said as he returned to them. “That’s the TARDIS sorted. K9 is hunkered down inside for the ride.” He waved to the carter and his boy as they moved off out under the archway with the TARDIS, on its side, fixed firmly in place. “You put the perception filter on, I presume?” Jamie asked. It still looked like a twentieth century police box to him. With that he lifted Stella, side saddle, onto one large horse and nodded to Jamie and Wyn to mount the other two as he climbed up in front of her. Wyn was a bit disconcerted by the idea of riding side saddle, but she had to admit it felt very elegant and feminine. Jamie rode close beside her and The Doctor with Stella took the lead. Behind them came a stable lad riding his own horse and leading the laden pack horse. They rode out of the yard of the inn called The Swan and took a steep but well made road – well made for the early seventeenth century anyway. It wasn’t long before the road turned, though it kept on rising further. They looked down from their elevated view over the village of Whalley where they had stayed, the little houses, the inn and its yard, the church, the ruined abbey and the big house where the lord of the manor lived, and the river Calder snaking around it on its way to become a tributary of the Ribble a few miles down the wide valley. He looked around favourably at the east Lancashire countryside, especially the dark forests on the flanks of steep hills. His eyes fixed on the highest hill to be seen, a long ridge like a great animal lying at rest. It stretched across their immediate view. In the iron grey light of a late October day it looked sullen and grey itself, strangely foreboding, and yet captivating. The Doctor grinned widely and wouldn’t say any more. Wyn laughed and told him that he was a pain in the neck when he was being ‘enigmatic’. He just grinned even wider and dropped back to have a word with the stable lad. It wasn’t a difficult journey. Two and a half hours at a horse’s leisurely walking pace. The Tu’lK’et’h would have thought it a mere stroll. Even so, they were all glad when they turned off the seventeenth century equivalent of the A671 to Burnley and along a narrower, private road with meadows either side then two stands of trees that sheltered a solid looking mansion of the sort Wyn and Stella had both learnt about in their early years of high school. This, The Doctor told them, was Read Hall, where they were visiting the old friend he spoke of, one Sir Roger Nowell, High Sheriff of Lancashire and Magistrate in this district. An outdoor servant came to attend their horses and show the stable lad where he could find the kitchen and get ale and bread before he set off back to Whalley with his master’s horses. Indoor servants in smart livery took the baggage and led the guests in through the main door. They were conducted to a warm parlour, lit by candles over the fireplace and the grey sunlight coming through the glazed window. Roger Nowell was seated in an elbow chair by the fire in his day gown, a tankard of ale and a plate of bread and cheese by his side. A woman sat opposite him with a similar meal. The master of the house rose to greet his guests warmly. “Clean living,” The Doctor said in reply. “You are in fine health yourself for your years.” Nowell was at least sixty, possibly nearer seventy, a good age for this period, but he was strongly built, broad shouldered and with a lean body. His eyes were bright and alert and his hair still had some chestnut-brown among the iron grey. He bowed courteously to Jamie and a deeper, graciously charming bow to Wyn and Stella as The Doctor introduced them as Master and Mistress Garr Jass, and the honourable Stella Grant Jones of Wales, who travelled under his protection to see something of England before she was portioned off into marriage. “You remember Margery, of course,” Nowell said to The Doctor and he answered that he did. Then Margery suggested that she should take the ladies above stair to freshen up from their journey. The Doctor took the opposite chair at the fire and Jamie found himself a comfortable place on a padded window seat where he could look out on the view. “You are breakfasting late, Roger,” The Doctor pointed out as they settled comfortably and he accepted the servant’s offer of cheese and ale for himself and Jamie. “Was it foul play then?” The Doctor asked, interested to hear of anything of the sort. Mischief, more like,” Nowell answered dismissively as he finished his breakfast and stood to take down a stout box that contained pipes and tobacco. He offered The Doctor one and Jamie was surprised when he joined with Nowell in the ritual of filling and lighting. He diplomatically refused the offer for himself. He looked out on the cold morning, glad to be in a warm room. He looked up at the hill that dominated the view and remembered the weather that had battered against the shutters of the room he slept in last night. “Aye, I thought that, too,” Nowell agreed. He seemed about to expand on his thoughts but stopped as the ladies returned to the room, divested of their cloaks and with faces sprinkled with water. Wyn and Stella both stared at The Doctor smoking a seventeenth century clay pipe. When he had mentioned it earlier they had been convinced he was joking. “You KNOW that’s not good for you, don’t you!” Wyn told him. Margery looked unconvinced. Wyn wondered what she would say if she knew about twenty-first century views of smoking and was determined to have stronger words with The Doctor later. They all three of them joined Jamie by the window and he filled them in on the conversation. “Tonight?” Wyn queried, looking to The Doctor and Sir Roger. “It WASN’T your own choice?” The Doctor seemed surprised by that. Margery said nothing but she raised her eyebrows. There was an expression on her face that Nowell caught and laughed aloud. The Doctor caught the look and smiled, too. “What’s the joke?” Wyn demanded. “She was Alice Nutter, one of those hung for witchcraft,” The Doctor explained. Margery laughed out loud at that and her laughter was the sort that banished cares. Wyn and Stella had enjoyed her company as they freshened up and decided they liked her. She was something of a kindred spirit, in fact. At seventeen she had been Roger’s helpmate in tracking down and bringing those infamous witches to justice. Wyn had been The Doctor’s companion at the same age in various adventures and Stella now joined her in the same role. Of course they couldn’t share those adventures with Margery, but somehow the three of them recognised the same qualities in each other straight away. Now they contemplated a shared adventure as they listened to The Doctor and Sir Roger talk of the possibility of trouble tonight. “You’ll not exclude us?” Margery spoke up when Nowell suggested riding with the Watch after nightfall. Nowell and The Doctor both looked around. seventeenth century Margery and her twenty-first century female conspirators all had the same look on their faces. It was one both men knew and dared not argue against. “You’ll wear breeches beneath your riding skirts and sit astride the horses safely,” Nowell said. “The Hill is no place for feminine niceties even in daylight.” But he assented to them being a part of the venture on those terms. That said the conversation turned to less immediate matters. The Doctor and Nowell were soon discussing the problems of a magistrate keeping law in a wild countryside that lent itself too easily to lawlessness. Wyn half listened and remembered that among his accomplishments The Doctor DID have a law degree from his home world. He understood the terminology and kept up the conversation easily. Margery, meanwhile, talked with them about more trivial things such as balls and other social customs of the ‘north parts’, assuming them to be different from those in Wales, which for her must have been as foreign and far away as the ‘New World’ her cousin had visited. The morning and early afternoon passed that way, punctuated by servants bringing cheese and apple tarts and copious amounts of ale, which they gradually got accustomed to as a way of slaking thirst. Mid afternoon they were treated to a meeting with the Lady who had been the subject of so much of the conversation. Nowell’s chief house servant showed her into the drawing room and he was, of course, expected to offer her hospitality. The Doctor gave up his seat by the fire and stood leaning on the mantle instead, watching her closely. She was about forty-five years of age, but slender and still something of a handsome woman with black hair free of grey and firm features on what was a rather severe face. She had come with information. She had learnt that there was to be a Sabbat on the hill tonight. “From where does a Lady such as yourself hear such things?” Nowell asked with a sly smile at The Doctor, who was listening and watching Lady Peniston carefully. “Was he, indeed?” She turned and looked at him. He looked at her. For a brief moment The Doctor felt that HE was the one at a disadvantage. There was something in her look that chilled him. There was something about him that startled her, too, if the very brief flicker of a reaction was true. She regained her poise at once, but he had seen it. He had made his own judgement about Lady Penistone. As she had made her judgement about him. He watched as her eyes turned towards his companions and took them in one by one. She seemed to be analysing them all deeply. Jamie puzzled and interested her nearly as much as The Doctor obviously did. He met her gaze with a carefully composed expression. Margery was trying to do the same, but the sour ale taste crept across her face despite her efforts. Wyn had a very similar expression. Stella noticed the two of them and did her best not to giggle. All in all they were glad when Lady Penistone took her leave. Something of the pleasant afternoon’s hospitality resumed. At least until about three o’clock when Stella failed to hide a yawn and The Doctor suggested that the ladies should have a rest in their chamber. Jamie confessed to needing a short respite, too, claiming to have been disturbed by the wind last night against an ill-fitting window shutter. Margery was happy to be hostess, conducting them to the rooms that the servants had prepared for the guests. They were all quite genuinely weary and welcomed the idea of a sleep before the promised night time adventure, but they also expected it to be a ploy by The Doctor to talk to them all privately. He did find an excuse to go up to the chambers once they were settled. He tapped on the door and slipped inside. Stella was lying on the smaller bed where a servant might spend the night. Wyn and Jamie were lying on the big four poster bed together. He noted that Jamie had reverted to female. In the doublet and hose she looked strangely androgynous. The Doctor’s companions looked at him thoughtfully as he talked of his famous friends through history. It sounded like a fantastic adventure, and yet at the same time a lonely one. Wyn wondered if she would ever live long enough to know all his secrets. He wasn’t particularly worried about it. It WOULD take a horse and cart with a full load a lot longer to negotiate the steep upland roads and the weather was not the best. Wheels stuck in muddy ruts, all kinds of ordinary delays would make it a difficult trip. He vowed to tip Master Cobb well for his effort. But the servants had not seen any sign of a delivery and by the time his friends had woken from their naps and dressed for dinner he really was starting to be anxious. He shared his concern with Roger Nowell as they ate. Knowing that something might have happened to the TARDIS spoiled their appetites. They ate only enough of the food to stoke them against a cold night’s riding, then quickly they all donned warm cloaks and were off. Again Stella rode with The Doctor, but this time in front of him and astride the horse. She, Wyn and Margery were breeched as Nowell had instructed and rode in the man’s style. Four of Roger’s servants rode with them, carrying torches. All of the men had swords. Jamie surprised The Doctor by strapping on the scabbard with practiced ease. He, of course, was well versed in swordsmanship. Nowell produced two short daggers and passed them to Margery and Wyn. “Should we be beset by more devilry than we expect, protect yourselves. Do not hesitate to do so,” he said. They both accepted the weapons uneasily. For all his lightness about the ‘mischief’ earlier Nowell now seemed worried. They moved off, along the private road and then out onto the future turnpike road that later still would be the A671. In this time and place it was a dark, dark place. It would have been a moonlit night but the clouds were still sullen, heavy and unbroken. There were a few faint lights from time to time - candles in the cabin homes of peasants and brighter lamps in the more substantial homes of the yeoman farmers and other better off classes. But street lighting was unheard of and the way was dark beyond the light cast by their torches. It was just possible to make out the brooding hill from the equally brooding sky, and the darker patch that was the Pendle forest, but beyond that it was impossible to get any bearings. The Doctor reined in his horse. So did the others. He and Jamie jumped down first and ran. Nowell was about to follow but The Doctor waved him back. He had taken his sonic screwdriver from inside his doublet and was using it as a penlight, concealed in his hand as he bent to look at the ‘something’ Stella had spotted. It was a boy, lying in the overgrown grass at the edge of the road. They would easily have missed him. It looked as if he had fallen and rolled judging by the broken grasses. “The carter’s boy,” The Doctor said as he examined him and determined that he was alive, though dreadfully cold from exposure to the elements. He had a broken leg, too. Lifting him would hurt if he were not unconscious to all sensation. The Doctor carried the boy as gently as he could and put him up on Jamie’s horse. Jamie mounted and held him securely. The Doctor slipped the sonic screwdriver into his hand. “Understood,” Jamie whispered. One of Roger’s servants went with him as he turned his horse and rode for Read Hall. It was only a mile. They should be all right, The Doctor thought. They all turned and looked at the hill. That had been their first objective. But now they had two problems. And what was their priority? Then there was a shout and the sound of hoofbeats. Another party with torches approached. Nowell and his men all drew their swords. The Doctor did, too. As the two pools of light merged they saw a dozen men in jerkins and breeches of manual workers. They, too had swords drawn, but less elaborate ones. At once though, both sides identified each other and sheathed their weapons. The Constable of the Watch rode towards Nowell. His news was grave. Master Cobb was dead, stabbed through with knives, and his cart nowhere to be seen, nor his boy. His hearts were heavy all the same as they turned to the cross country route that would bring them to the Hill in a short time. It wasn’t the first time he had ‘lost’ the TARDIS. It had been stolen once in the Himalayas when he was travelling with Marco Polo. Once even earlier than that, when the chameleon switch still worked it had disguised itself as a car and been towed away for having an invalid tax disc. The worst had been more recent when it had fallen through a crevice into the heart of that strange planet called Crop Tor. That time he really had thought he had lost it. He had been forced to contemplate a life without his time machine. A Time Lord without the power to command time. He felt that way now. He needed the TARDIS. Without it, in this century he was a man with the wrong sort of blood and two hearts, and if he was ever found out his life could well end with a lynching rope even if he had the friendship of Roger and Margery to fall back on. There were his friends to consider, too. What of them? And Jo and Cliff who had trusted him with the care of their daughters? And there was simply the fact that the TARDIS WAS his oldest and most constant friend. He had always had a symbiotic link with it. He used to be able to sense where it was within a few miles. He always said he couldn’t lose it. He wondered if he could sense it now. He took a deep breath and half-closed his eyes, concentrating hard on the TARDIS rather than the road ahead. Yes, he thought. He could feel something. The TARDIS WAS out there somewhere. He might even be able to get a direction if he could concentrate deeper. But he wasn’t able to do so now. A shout went up from the watchmen ahead and he saw at once what the excitement was. 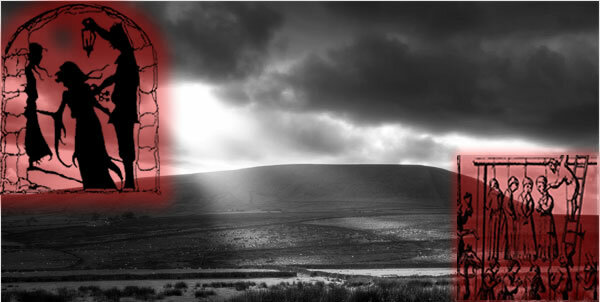 They were climbing Pendle Hill now, and at its summit there were lights. Not just a bonfire, but moving lights, torches held by people. With his Gallifreyan eyes, even without his trick glasses he didn’t dare use here, he could see better than anyone else yet could. He saw a bonfire flickering and shadows passing across it as people moved around it. As they got closer they heard sounds, too. A rhythmic chanting, though as yet the words could not be made out. A witches coven? A black sabbat? A pagan ritual? Whatever was going on it was illegal in this time and place and a matter for the watch and the magistrate. “The Doctor is right,” Nowell added. They moved slowly towards the top, keeping to the shadows and such cover as was afforded by scrubby bushes and outcrops. Nowell led the way, the watch and its Constable following. The Doctor hung behind with Stella still riding with him. Margery and Wyn were with him. “It really IS a witches sabbat!” Margery exclaimed as they drew closer and could see more clearly. Most of the people who chanted and moved in a circle around the fire were young women, though there were some young men, too. They were all, male and female, in long grey ‘shifts’ of rough fabric with head and arm holes and rope tying the waist. Naturally enough there wasn’t a pointy hat in sight. But clearly this was witchcraft of some kind. The chanting was Latin, but nothing so sophisticated as a black sabbat. It was just a few random words spoken over and over, and Wyn, as she listened, thought it was as if the people chanting them didn’t actually know what the words meant, as if they had learnt them by rote. Whatever he was wondering went unspoken because at that moment the cover was blown by a watchman who called out and ran at the crowd. At once they scattered, dropping their torches. The watchmen and the Constable and Nowell all dismounted quickly and ran to catch hold of as many of the culprits as they could. The Doctor suddenly jumped from his horse and returned moments later with a struggling ‘witch’ in his custody. When she kicked out and bit him he applied just enough pressure with his thumb against her neck to render her limbs paralysed temporarily. That meant that she got a much more comfortable journey than many of the other captives, because The Doctor hauled her up on his horse with Stella and walked. The others were tied to the reins of the watchmen and made to run along beside them. Nowell was on the point of answering that when Wyn and Margery, the only two riders not escorting a prisoner suddenly shot off to the left. The Doctor followed them at a run and saw with his superior eyesight what had sent them off the path. Their two horses blocked the path of a man, dressed in the same rough clothing, who had tried to get away in the confusion. He turned and ran back and The Doctor blocked him, but he missed the knife that glinted in his hand. He felt it slash his arm before he could disarm him. The cut went deep, glancing off the bone, but The Doctor brought his good arm around and subdued the man. “No,” he lied. “A glancing blow only. There is more damage to a good silk doublet.” He let the Watchmen take the man, but he pocketed the knife. He wanted to remove any traces of his own blood before it was seen as evidence. He would have to change his clothes, too, and get Wyn to put on a bandage to make it look as if he did have a flesh wound that needed treating. “You ladies took a risk, though,” he said. That was a sensible plan and they made the change before they set off again, heading directly for Read Hall where Nowell said the miscreants would be incarcerated in a locked cellar overnight and he would hold interrogative sessions in the morning. The Doctor’s arm quickly healed, as he knew it would, but he made a pretence of stiffness as he rode and Wyn kept close beside him. It gave him chance to look closer at the girl he had captured. She was semi-conscious now and didn’t seem in any state to cast a spell upon him. She seemed frightened and uncertain of where she was or why she was there. With his ‘good’ arm The Doctor put a hand on her forehead and concentrated on her thoughts. He was surprised by what he saw. And at the same time, not wholly surprised. Because something had been wrong with the set up here all along. The ‘witches’ were all locked up in the cellar and Nowell sent his own men and the constable and the men of the watch to the kitchen to help themselves to food and drink after their efforts. He had a cold supper and wine brought to his drawing room where he and Margery and their guests rested themselves and talked over the evening’s events. The adventure on the hill was quickly related to Jamie who in return gave his own report. “Ladyship?” The word was echoed by all who listened and it seemed the same Lady was in all their minds - the one that gave Margery a taste of sour ale. That expression was on her face now. “We would need more than that to accuse a woman of breeding and wealth,” Nowell observed. “Then the law is cruel and horrible,” Stella burst out before running from the room, tears in her eyes. Wyn followed her. “We would all be best taking to our beds now,” Nowell said. “The watch will be rising at first light to make inquiries about the robbery, Doctor. I’ll advise them to look in the direction of Rough Lee, I think. If any evidence is found to support the boy’s testimony I will act upon it. Stella was still upset when The Doctor and Jamie went up to their adjoining chambers. She was lying on her bed crying. Wyn was trying to comfort her but she wasn’t having it. “No,” Wyn answered. “We can manage that for ourselves.” He warned them to lock the door and draw their bed-curtains and then went to the adjoining room. He wasn’t sure if he wanted to sleep himself. He had a lot to think about, still. The quiet times when his Human friends slept were when he did most of his deep thinking. He sat down on the bed anyway, and pulled off the long leather boots he felt had become welded to his feet. He liked period clothes, but he sorely missed his lightweight canvas shoes. When he got to wear them again he would feel like he could float. That train of thought just reminded him of what else he was missing. His suit and shoes were inside the TARDIS. “What is it?” The Doctor could tell he had something more to say. This time he did lie down. He didn’t sleep, though. He put his mind into a slow trance. His hearts beat slow, his breathing was only shallow. His brain alone worked hard, reaching beyond the dark room where he lay. Yes, he was the one person in this place who was capable of what they would call witchcraft. Except it wasn’t. It was simply a natural gift of his race, honed and perfected in special tutorials at the Prydonian Academy. He felt the minds of his friends in the room next door. Stella was sleeping, though fitfully, Wyn and Jamie were close to sleep, cuddled up close together. Beyond, he felt Margery sleeping soundly, Nowell feeling the cold of the night more than he would admit. He was not as robust as he pretended. He felt the servants at their rest, except for two stout men who stood guard down by the cellar. He felt the hazy minds of the prisoners within. He passed over them quickly. They were disturbing to look at. He promised himself he would help them later. 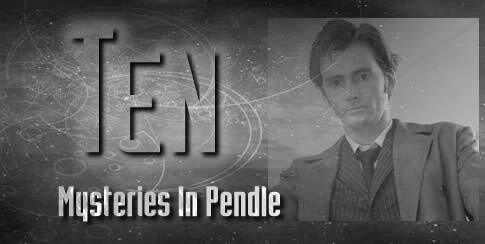 He let his mind roam further, beyond the quiet house and into the Pendle countryside. He could sense ordinary people at their rest after a hard day’s work, he could sense rogues who were not asleep and plotted lawlessness of the ordinary sort that kept Roger Nowell busy every day. It was nothing to do with him. He sought a different sort of mischief. He found his bearings and directed his probing mind towards the house called the Rough Lee. There he sensed something that didn’t surprise him and a number of things that did. He pulled his mind back and let it become calm and quiet like the rest of his body. He had a good idea of what was going on, now. At least half of the mystery, anyway. He was content to let himself rest now in the slow trance that was as refreshing to his body as eight hours of deep sleep. He woke Jamie while it was still dark. Wyn stirred, but not even for the chance of adventure was she prepared to get out of a warm bed into a cold, dark morning. Jamie dressed quickly in warm clothes and he and The Doctor slipped quietly through the silent house and out into the night. There was a pink glow to the horizon to the West where it wasn’t blocked by the Hill. Dawn wasn’t too far off. It was getting lighter by the time they found the place where Master Cobb had been waylaid. There were all too obvious signs of violence. The grass was broken down and there was a darker patch on the rough ground where the murdered man had bled out. There was a jumble of footprints that indicated a struggle and confusion and the deep tracks of cartwheels where they had stood for a time with a heavy load. What there wasn’t, was any sign that the cart had been driven away. Which was no surprise to The Doctor. Jamie pulled back his doublet sleeve and pressed buttons on his time agent wristlet. “I know the source,” The Doctor said. “The Rough Lee.” The Doctor smiled grimly. He felt no triumph about being proved right. Not while he stood in this place, where a good, honest man had died for no good reason. He felt a little guilty that he had asked him to transport the TARDIS. He could have found another way of getting it to Read Hall. But even a Time Lord couldn’t turn back time to prevent such deeds. All he could do was make sure those responsible were brought to justice. “You got enough juice in that wristlet of yours for a short transport?” he asked Jamie. The Doctor made a short, sarcastic laugh and took hold of Jamie’s arm. He applied the sonic screwdriver to the wristlet. “Now it takes two,” he said and Jamie grinned and pressed the transmat button. It would never be his favourite form of travel, having his molecules disassembled and reassembled. But if he was right, at least it would only be a one way trip. As his vision cleared and he looked around his new location he gave a short cry of triumph. They were in a cellar that clearly belonged to a substantial house. It had all of the expected things in it; casks of ale, flagons of wine, cheeses ripening, hams curing on hooks. Among the unusual things was a tall blue box with the words Police Public Call Box in familiar letters around the top. But the TARDIS was not the only incongruous thing in this cellar. The Doctor and Jamie both looked closely at the other anachronism that was sitting there. It looked like a space ship’s navigation console lashed to a static transmat control panel. “Cheap form of time and space travel,” The Doctor explained. “If the TARDIS is a sleek ocean liner and your vortex manipulator is an open dingy, this is a tramp steamer that’s tramped into far too many foreign ports. And it’s broken, obviously. Somebody crashed here in this time and has been bodging together what was left of their craft.” He pressed a button on the console and noted that there was a scanner that would have registered the arrival of his TARDIS. A prize the owner of this set up could not have resisted. “I’ve got a feeling she’ll want to confront us later,” he answered. Wyn and Stella were overjoyed when they woke some hours later and learnt that the TARDIS was recovered, and not only because it meant they could use ‘civilised’ bathroom facilities and fill K9 in on what happened. They HAD been more than a little worried about the possibility of living in the seventeenth century. Quite apart from the hygiene issues and the fact that they both hated the taste of ale, AND never seeing their home and family again, the fact that Margery was about the only woman alive who even considered the idea of female emancipation, there was the dreadful thought of a bitter, bloody civil war in their natural lifetime. There was also the ever present risk of being found out as not of this time, or for Jamie and The Doctor of being found not of this world. Wyn had a horrible vision she couldn’t shift of them both being hanged as witches or worse at this Lancaster that Nowell spoke of. 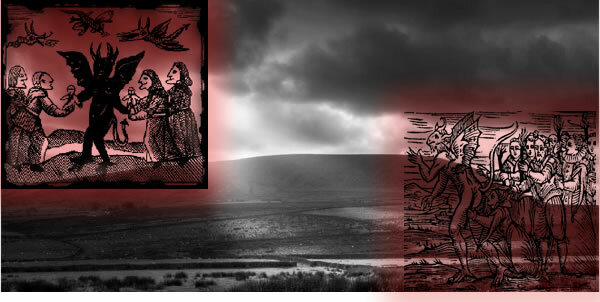 Though apparently there WAS nothing worse than a witch in 1622. The breakfast of bacon and ale was a solemn affair this morning, for a solemn duty awaited them all afterwards. Fifteen prisoners needed to be formally questioned and in all likelihood formally charged with a capital crime. Stella was still distressed about that. She believed that the law in this instance was more terrible than the crime. Even The Doctor faced her wrath about it because he agreed on principle with the seventeenth century statutes for punishment of witchcraft. More than that he would not say. Stella was still not wholly satisfied but he would not budge. He had a half a plan in his head. He had half an idea of what was going to happen later. But for the moment events just had to unfold. As soon as breakfast was over, Nowell and Margery went to the substantial room with a surprisingly small and barred window that was used as the Magistrate’s courtroom when Nowell sat in Session every second Monday. It had a long table across one end and seats around the sides for the bailiff and constable and any who came to watch the proceedings. Nowell took up his seat and Margery sat at his side, acting as clerk with quill pens, ink, knife and sand shaker and a sheaf of parchment on which to record the testimony given and the pronouncements of the magistrate. To the surprise of his companions The Doctor sat at the table, too. Nowell was under the impression that he was a notarised lawyer and appointed him as chief interrogator – as prosecutor. Stella glared at him as she sat in a chair at the back of the room alongside Wyn and Jamie. Nowell called for the first of the prisoners to be brought in and the bailiff went to do his bidding. It was a girl. She looked about Stella’s age. She gave her name as Anne Rufford and her occupation as kitchen maid at the Swan Inn. The Doctor asked her in a firm, steady, but not unkind voice, to explain what she was going up on the Hill last night. He noticed a stifled giggle and knew that Stella had just worked out what “skyclad” meant. As she composed her face he returned to the important detail. “I… nobody, sir,” the girl answered. But The Doctor thought the lie pained her. He turned to Margery and asked her to read back the testimony, such as it was. The words ‘I was commanded to go up on the Hill’ were there in black and white. WHO commanded you?” The Doctor demanded and there was a harder tone in his voice. Roger Nowell repeated the question but the girl was not even close to being able to answer them. Her eyes were glazed over and she was shaking with fear as if a devil was, indeed, working on her soul, though The Doctor knew it was nothing of the sort and when she turned deathly pale and fainted he was out of his seat and at her side in time to catch her. “She is still a prisoner with charges to answer,” Nowell said, rising, also. “But let her be taken to a quiet place where she can recover.” The constable rose and did as he commanded. “Let the next prisoner be brought,” Nowell added and The Doctor took his seat beside him. “We shall see,” The Doctor answered as the next prisoner, another girl of similar age and class, was brought in. This one was Agnes Sowerby who was scullery maid at the home of the master miller of Wheathead. When prompted she spoke openly, regardless of the penalties, of conjuring spirits on the Hill. But when she was asked to say who had commanded the Sabbat she began to shake and tremble and became incoherent. The Doctor half smiled as his Gallifreyan ears picked up a whisper. Stella leaned towards Wyn and asked her what was the film about witch trials in puritan America that they saw a while back. The one where all the girls got hysterical and kept accusing innocent people. Wyn replied to her. The Doctor nodded imperceptibly. He had thought the same thing, too. But this was more than just mass hysteria. By the time three more girls had been examined and all reacted the same way his own theory was coalescing. They weren’t all girls. A pair of ploughboys were brought before the court. The Doctor recognised the one who had attacked him with the dagger. The young man, no more than eighteen, recognised him and his eyes flickered between the prosecutor and the dagger that was presented as evidence. But The Doctor didn’t refer to his injury. He put the same questions, feeling a little sorry for Margery who had to keep scratching away at the parchment without even the luxury of a macro key on a stenography machine to type the recurring sentences quickly. The young man’s reaction to the key question was even more extreme than any of the girls. His eyes almost turned in their sockets and his teeth clamped together as he went into what in later centuries would be called a grand mal seizure. Again The Doctor was out of his seat, kneeling at his side and putting him into the recovery position, clearing his airways carefully and ensuring he could not bit his tongue in half. When it was over and he slipped into ordinary unconsciousness, the bailiff carried him away, again with Sir Roger Nowell’s injunction that he was still a prisoner and may yet have to answer further questions. Roger Nowell looked at him with surprise on his wise features. The Doctor bit his lip nervously. He was about to burn his boats as far as his relationship with Nowell was concerned. In endeavouring to clear the names of these innocents he was offering himself up instead, and exposing his friends to danger, too. He could feel their unease though he could not see their faces. He was too intent on Nowell’s expression as the good man searched his conscience in the face of this strange request. He had to hope he was as fair and open-minded as he had always believed him to be, that he WOULD understand that the science he spoke of was not witchcraft. “Bring in the next prisoner,” The Doctor said to the bailiff. While that was being done he looked around the room. He went to the far wall and took down a small mirror. Most mirrors of this time were polished steel, but the well off could afford real silver-backed glass if only in the very smallest panes. He picked up a candle in its silver stick, too, and waited for the bailiff to return. The prisoner was the girl he had put on his own horse last night. The one whose mind he had already read. He felt pleased at that coincidence. He had never read a mind without feeling a little of that mind remaining in his soul. That was one reason not to do it too often. Not every mind was something he wanted to carry with him. But he felt a responsibility for this girl even more than he did for the others. “What DO you remember, Mary?” he asked and she launched into the same story about conjuring devils. She seemed to condemn herself with her own words. “Enough,” The Doctor commanded. “We’ve heard that tale already, word for word. But I wonder what is your true story, Mary?” And he held up the mirror and the candle and moved them in such a way that a dancing light reflected off the mirror. He shone it in her eyes. She screwed them up against the painful glare. Mary did as she was told. She looked at the light even though it was painful. As she looked, her eyes seemed far less glazed and her face took on a look of horror. She burst into tears. The Doctor put down his strange tools and put his arms around her. When her tears were done he turned her to face Roger Nowell. He kept a gentle arm around her shoulders. Mary stopped speaking as the door to the justice room opened. Everyone turned as Lady Penistone swept inside. “Freed how?” Lady Penistone asked. Nowell, to his credit, realised where she was going and did not answer her, but she had seen the mirror and candle set aside and made a guess. Nowell said nothing, still, but he didn’t have to. She turned and looked directly at The Doctor. Roger Nowell still said nothing. Nor did The Doctor. Neither could deny that he HAD done something that, by his own admittance, might be construed as witchcraft. And until he had, Mary had not been able to say who had ordered her to go up the Hill and join the Sabbat. Lady Penistone’s version of events sounded convincing to anyone who didn’t know that The Doctor was innocent. The trouble was, Sir Roger Nowell couldn’t say for certain he was. Wyn sighed. She saw the trap, too. “You are a kitchen wench who will hang by my witness,” she answered raising a hand to strike the girl. The blow never came. The Doctor’s arm reached out and held her tightly. Now Lady Penistone had made a mistake. And it was Stella who spotted it. “I came by information…” she began. Lady Penistone moved sharply and suddenly towards the door. She got no further. Jamie proved that he could move fast, too, and blocked it. Nowell nodded to the Bailiff and Constable and they, also, moved to guard the only exit from the room. “Let what must be said be said,” Nowell said. “Come what may. But nobody will leave this room until it is done.” Lady Penistone looked mutinous, but the Bailiff and Constable were both strongly built young men and they were under Nowell’s orders. She turned and sat herself in a chair. The Doctor remained standing. He turned and looked at Sir Roger and Margery as they sat in their places, still. Margery looked bewildered but wild horses could not have dragged her away. Roger looked stern. He looked puzzled. He looked betrayed and angry. And The Doctor felt very sorry for that. He turned back to look at Sir Roger and Margery again. Margery’s mouth dropped open as she heard what he said. Roger’s face was impassive. “Doctor….” Sir Roger Nowell began to speak then gave up. He glanced at Margery. She had taken up her quill when The Doctor began to speak. He put his hand on her arm as if to halt her from making a record of his words, then he shook his head and told her to continue. He told The Doctor to continue, too. “E.T. phone home!” Stella said with a nervous giggle. “So, you admit that Mary and the others are innocent?” The Doctor asked. “Roger, Margery, do you note what she has said?” The Doctor looked at them firmly. “Yes, sir,” Mary said, curtseying to him. She left the room quietly. The Doctor watched her go then turned back to Lady Penistone. He stopped speaking. Because what he was going to say next he couldn’t say even to one as cold-hearted and cruel as Lady Penistone. He couldn’t tell her that she would never have had a reply to those messages she was sending from the top of the hill. She could never go home, any more than he could. Karn had burned the same day Gallifrey did. The whole solar system was destroyed. Her people, her world, was gone, too. The last ‘no’ was a heartbroken one. The Doctor felt her pain, but he couldn’t sympathise with her. He thought of an innocent man murdered and an orphaned boy left for dead. He gave his compassion to them. He stood back from her. He didn’t try to restrain her when she turned and ran towards the bailiff. When he realised what she meant to do it was too late. He saw her grab the bailiff’s sword and turn it in her hands before falling forward onto it. Stella and Wyn both screamed as they saw Lady Penistone fall, the cheap sword breaking as her body hit the floor. Margery gasped out loud but did not scream. A pool of blood quickly stained the polished wooden floor. It was lighter than Human blood, but not as light as Gallifreyan. She was the last of the hybrid race of Karn. And now she was dead. The Doctor felt a twinge of sorrow, but still he kept his compassion for the innocent. The Constable looked at The Doctor hesitantly. Was he still to take orders from him after all the strange things that had been said? There was a pause after the Bailiff carried Lady Penistone’s body out and the Constable went to summon the Watch to do the magistrate’s bidding. The Doctor stood in the middle of the floor still. Margery sanded the pages of parchment she had completed. Wyn and Stella and Jamie stood, wondering what would happen next. Margery did his bidding, too. Jamie, Wyn and Stella went with her. They looked at The Doctor anxiously before they were ushered out of the room. He remained standing where he was. Roger Nowell moved around his table, picking up the sheaf of parchment that Margery had filled. He read them through slowly then looked at The Doctor, still standing there. “What will Sir Roger do with The Doctor?” Stella asked as she sat on the bed she had slept in the night before. “Maybe you should leave in this… carriage… box….” Margery suggested. Jamie pulled up his sleeve and tapped on his wristlet quickly. “Wyn, Stella, get into the TARDIS,” he said. I’ll be back soon.” Then he reached out and pulled Margery around, holding her across her neck as he hit the transmat button. The two of them disappeared. They materialised in the drawing room where his wristlet had located The Doctor and Nowell. Margery swooned dizzily but kept to her feet well for her first time in a transmat. Jamie held onto her tightly. She was his hostage to exchange for The Doctor’s liberty. Except he didn’t seem to need liberating. He was sitting in the elbow chair opposite Nowell, drinking wine and smoking a noxious-smelling pipe. He looked up in surprise when he saw them appear. He stood up. So did Sir Roger. They walked back up the stairs in the ordinary way, Margery keeping her distance from Jamie in case he was impatient. Wyn and Stella hadn’t done as Jamie told them. They were still waiting in the bedroom. Margery and Sir Roger said goodbye to them properly. Stella even managed to hug Sir Roger, all forgiven between them. Then they stepped into the TARDIS. The door closed. Sir Roger put his arm across Margery’s shoulder and they watched as The Doctor’s strange machine disappeared in front of their eyes. “And that’s NOT witchcraft?” Margery asked as the sound died away. “How do they know which is which where they come from?” Margery wondered aloud.